Dessert lovers: Have you even had the debate in which you can't decide if you'd rather have a cookie or a cupcake? Yes, me too. The debate that has earned many hours staring at recipe books or many minutes in the line at the bakery eyeing up the baked goods in their glass cages. 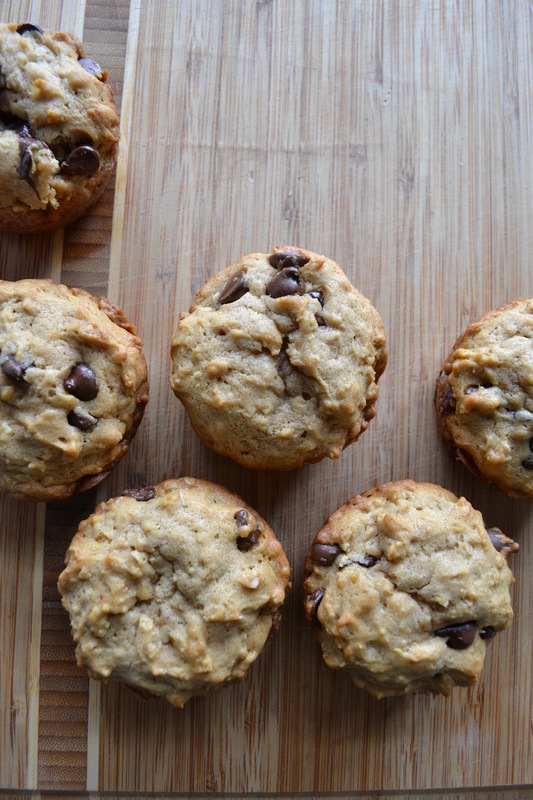 To put the debate to rest for a little while, this recipe is a cake-ier version of an oatmeal chocolate chip cookie, and can solve all the cookie, chocolate, cake, sugar cravings in one go. Preheat oven to 350 degrees Fahrenheit and line a cupcake tin with liners, or grease a cupcake tin with butter or non-stick spray. In a large bowl, whisk 1/4 cup of milk and brown sugar together until no lumps remain. 3. Whisk in vanilla and melted butter, until smooth and well combined. 4. Add the flour, oats, baking soda, salt and cinnamon to the wet ingredients and stir until well combined. 6. Drop about 1/4 to 1/3 of a cup of batter into the cupcake tins. 7. Bake for 15-17 minutes until the cupcakes are browned and the tops spring back when they are touched. Cool completely before icing. As someone who prefers a lighter hand with the frosting, I halved the original recipe and did not add brown sugar. If you'd prefer the full frosting experiencing the original can be found here. Cream butter with fork or wooden spoon until smooth. 2. Add powdered sugar and continue to cream until well combined. 3. Add cinnamon and vanilla and mix until well combined. 4. 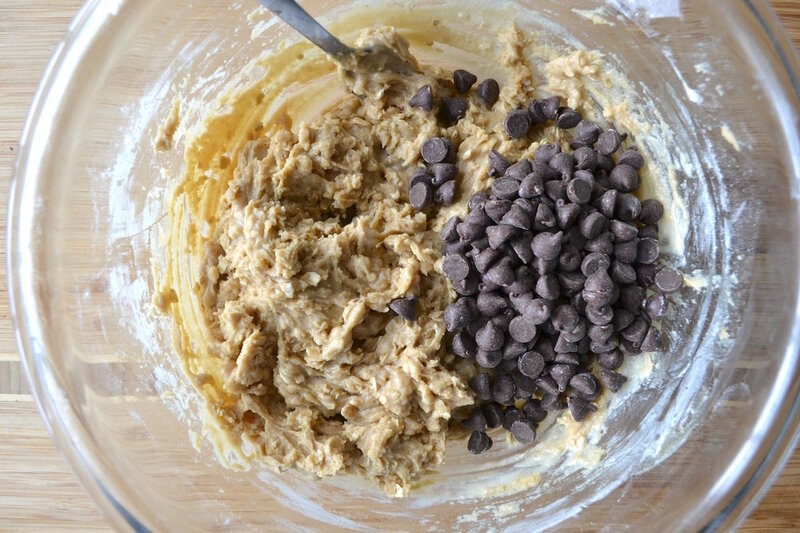 Add the chocolate chips and mix until the frosting has reached your desired look and consistency. Now for the best part, frosting the cupcakes. 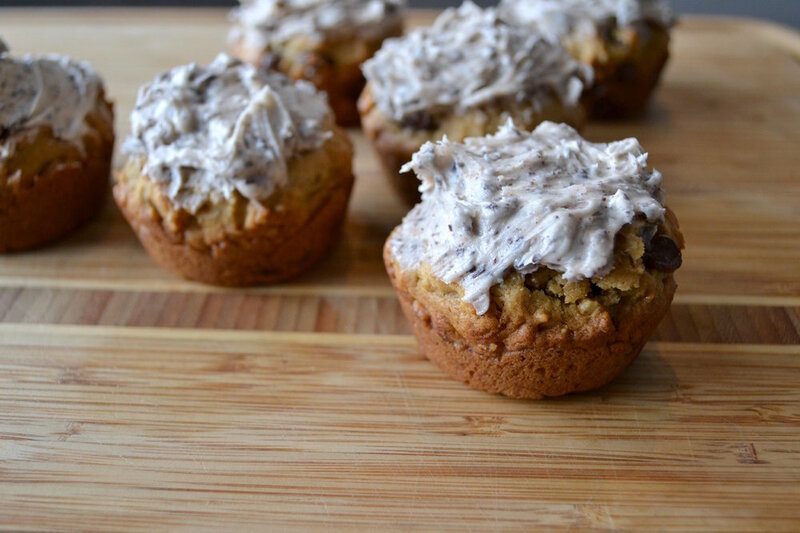 If you choose to bake the cupcakes in the tins without liners, the sides of the cupcakes will brown up much like a cookie and will give the outer layer a nice little crunch while the inside is soft and cake-y. The oatmeal gives the cake a little added texture too, and helps to balance out all the sweetness with all the sugar and chocolate. Though I don't think there is ever such a thing as too much chocolate. Is there?